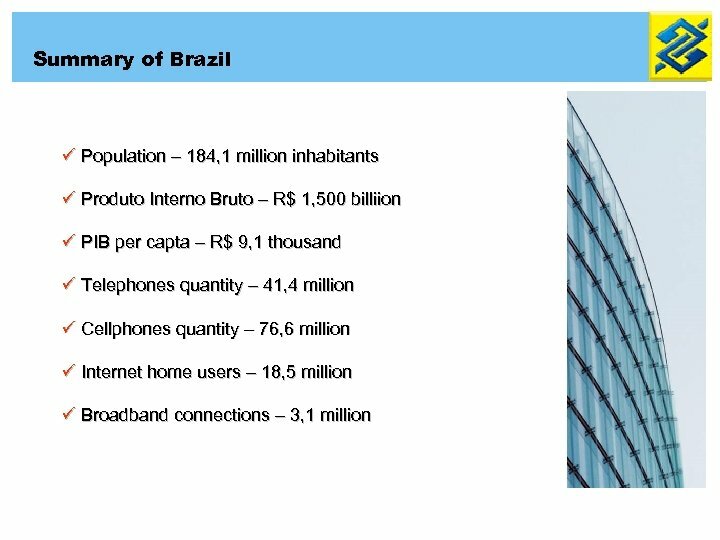 Brazilian mobile phones market share 89 MILLION CELLPHONES ESTIMATE FOR DEC/05 Source: Anatel 2005 – Estimate from “Teleco” ü Brazil is the 5 th mobile phones market share in the world and the 2 nd in America (1 st USA). 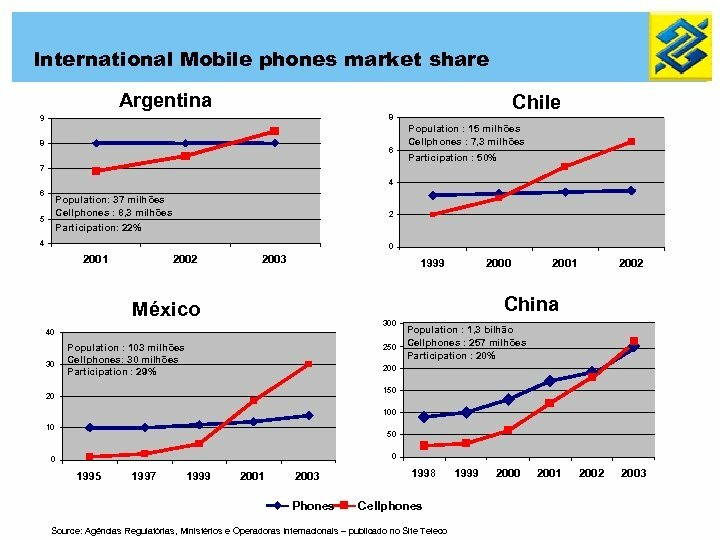 ü 38 cellphones for 100 inhabitants (Distrito Federal level = 101). ü 80% prepaid cellphones. 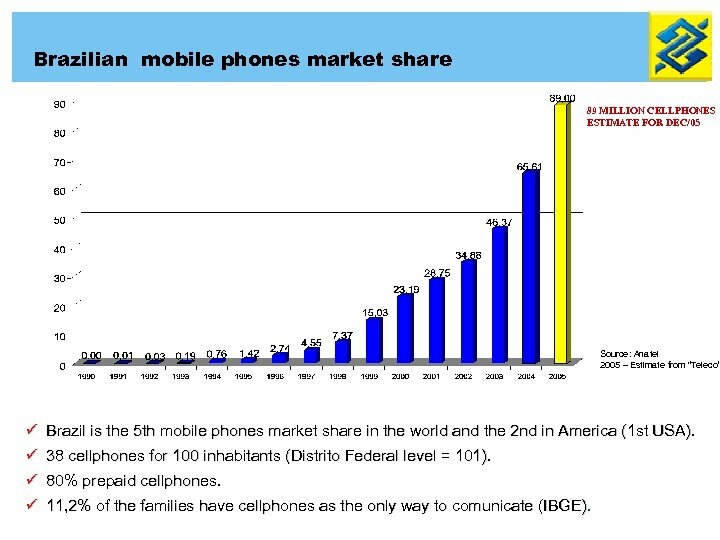 ü 11, 2% of the families have cellphones as the only way to comunicate (IBGE). 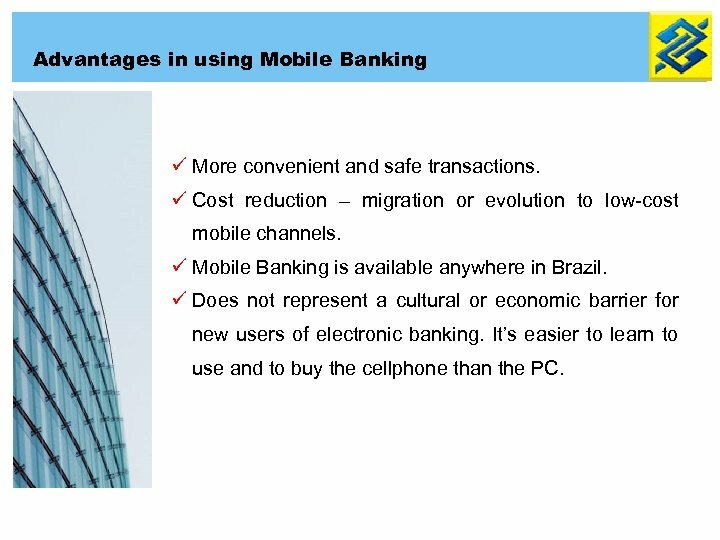 Advantages in using Mobile Banking ü More convenient and safe transactions. 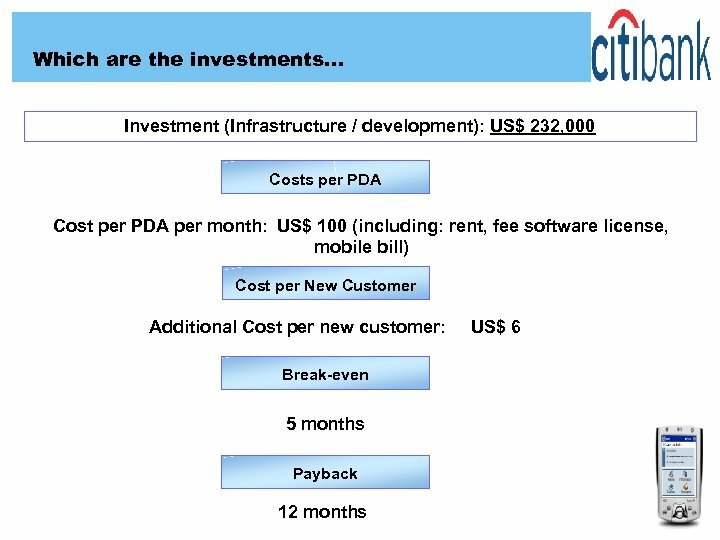 ü Cost reduction – migration or evolution to low-cost mobile channels. ü Mobile Banking is available anywhere in Brazil. 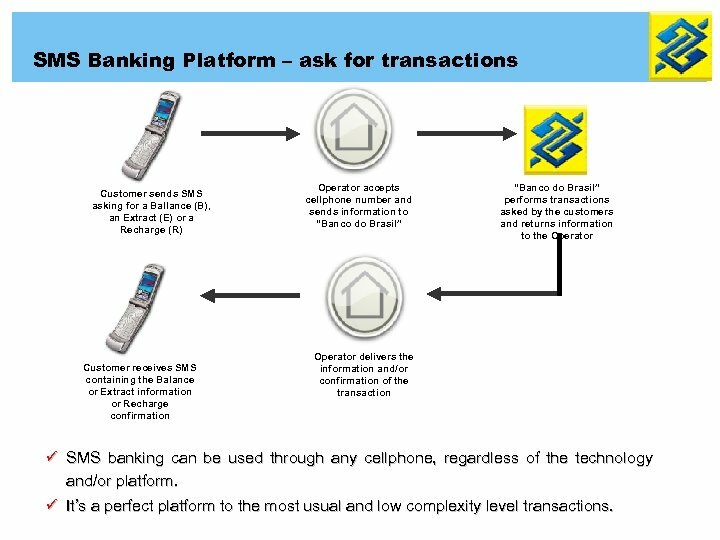 ü Does not represent a cultural or economic barrier for new users of electronic banking. It’s easier to learn to use and to buy the cellphone than the PC. 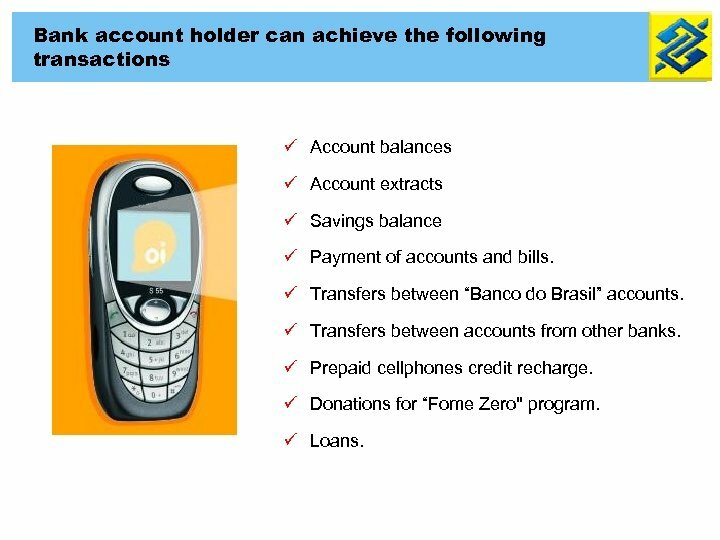 Bank account holder can achieve the following transactions ü Account balances ü Account extracts ü Savings balance ü Payment of accounts and bills. ü Transfers between “Banco do Brasil” accounts. 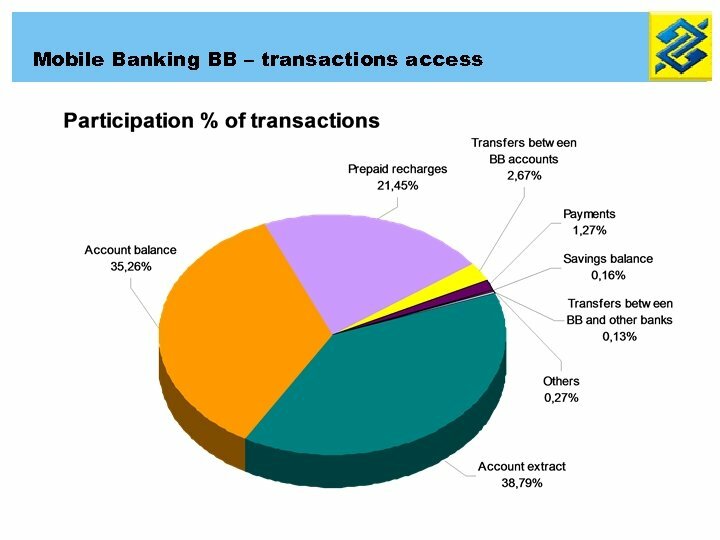 ü Transfers between accounts from other banks. ü Prepaid cellphones credit recharge. ü Donations for “Fome Zero" program. ü Loans. 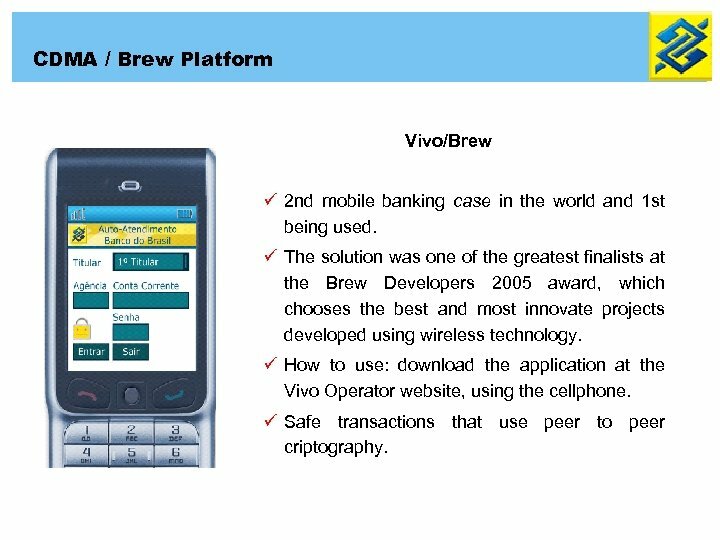 CDMA / Brew Platform Vivo/Brew ü 2 nd mobile banking case in the world and 1 st being used. 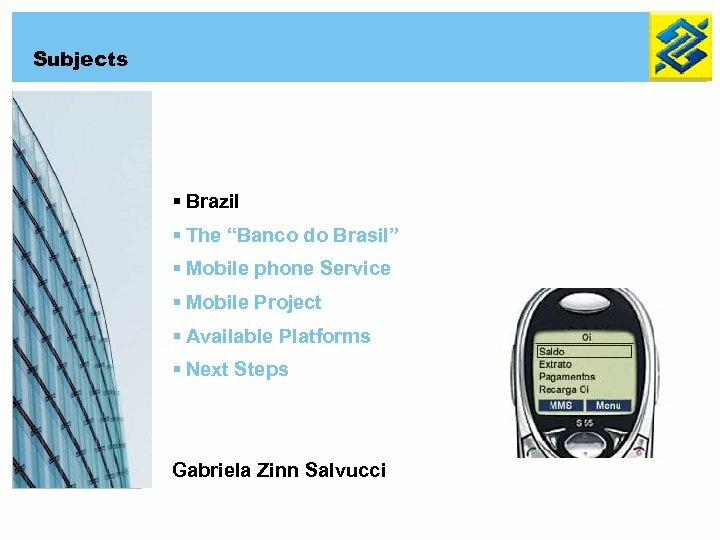 ü The solution was one of the greatest finalists at the Brew Developers 2005 award, which chooses the best and most innovate projects developed using wireless technology. 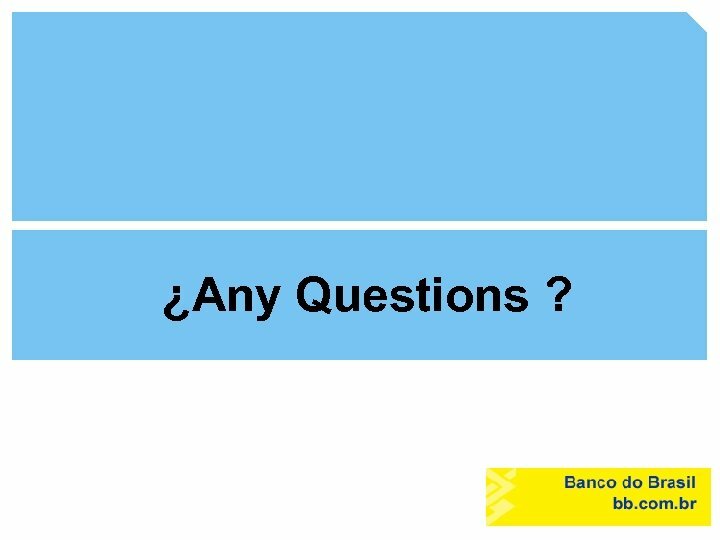 ü How to use: download the application at the Vivo Operator website, using the cellphone. 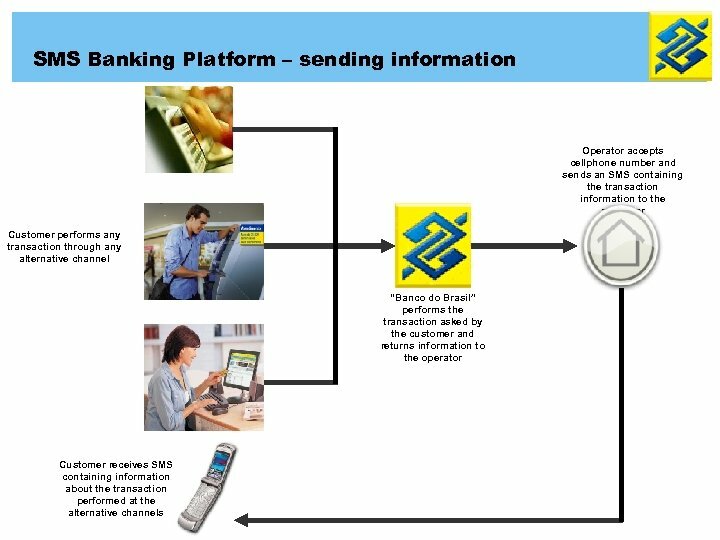 ü Safe transactions that use peer to peer criptography. WAP 2. 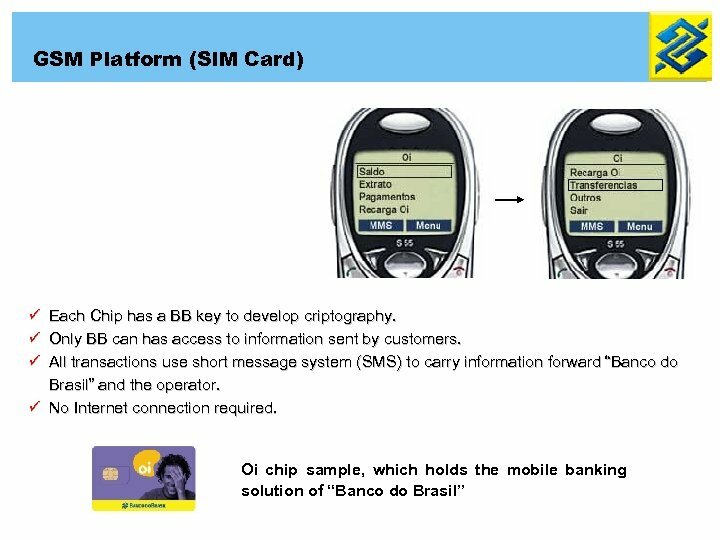 0 Platform ü Used both in GSM and CDMA platform cellphones. ü The customer connects to the Internet WAP 2 website of “Banco do Brasil” to have access to the bank account, or through the Operator website. 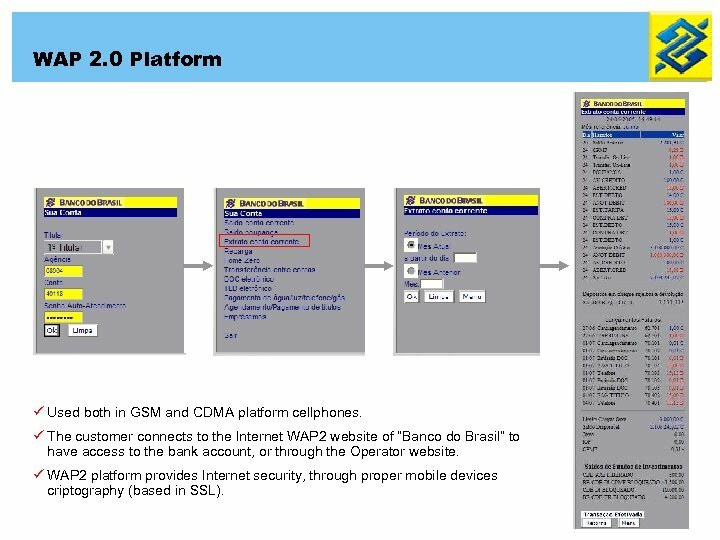 ü WAP 2 platform provides Internet security, through proper mobile devices criptography (based in SSL). 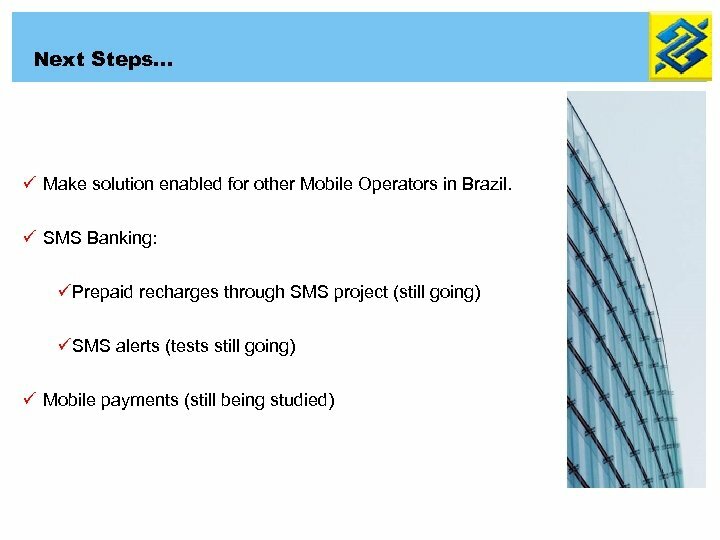 SMS Banking Platform – ask for transactions Customer sends SMS asking for a Ballance (B), an Extract (E) or a Recharge (R) Customer receives SMS containing the Balance or Extract information or Recharge confirmation Operator accepts cellphone number and sends information to “Banco do Brasil” performs transactions asked by the customers and returns information to the Operator delivers the information and/or confirmation of the transaction ü SMS banking can be used through any cellphone, regardless of the technology and/or platform. ü It’s a perfect platform to the most usual and low complexity level transactions. Presence in Brazil 1. 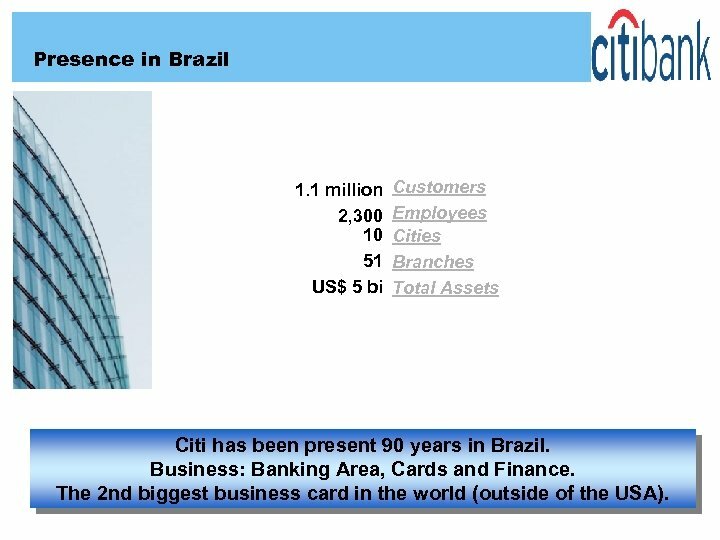 1 million 2, 300 10 51 US$ 5 bi Customers Employees Cities Branches Total Assets Citi has been present 90 years in Brazil. 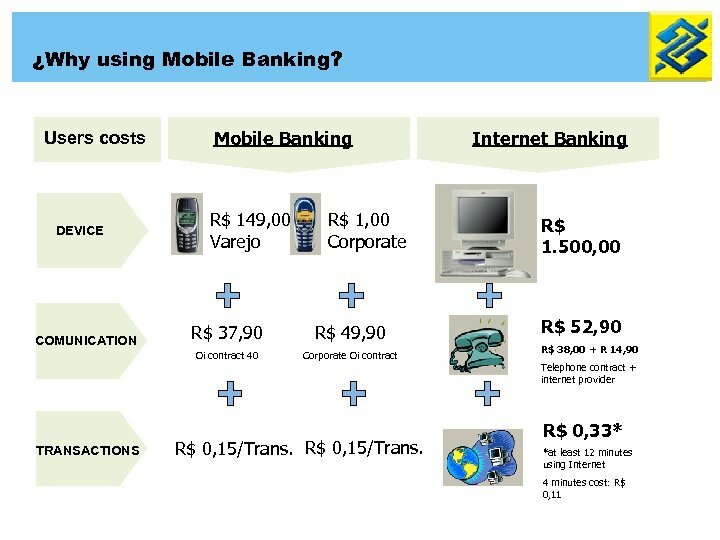 Business: Banking Area, Cards and Finance. The 2 nd biggest business card in the world (outside of the USA). 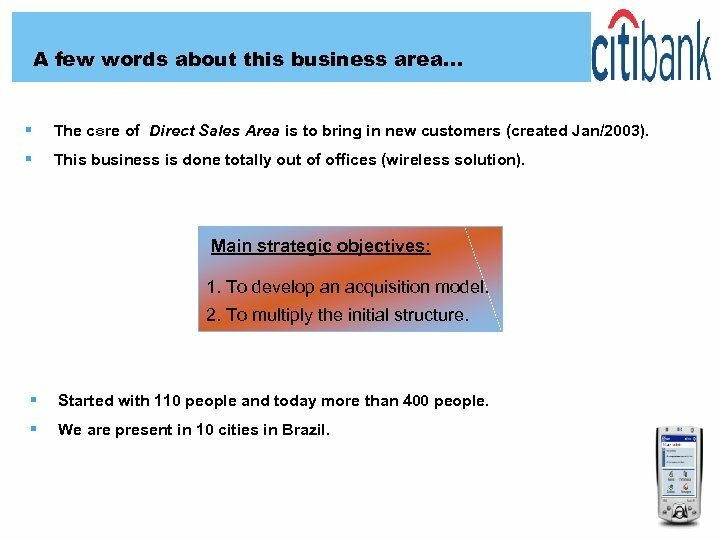 A few words about this business area… § The core of Direct Sales Area is to bring in new customers (created Jan/2003). § This business is done totally out of offices (wireless solution). Main strategic objectives: 1. To develop an acquisition model. 2. To multiply the initial structure. § Started with 110 people and today more than 400 people. 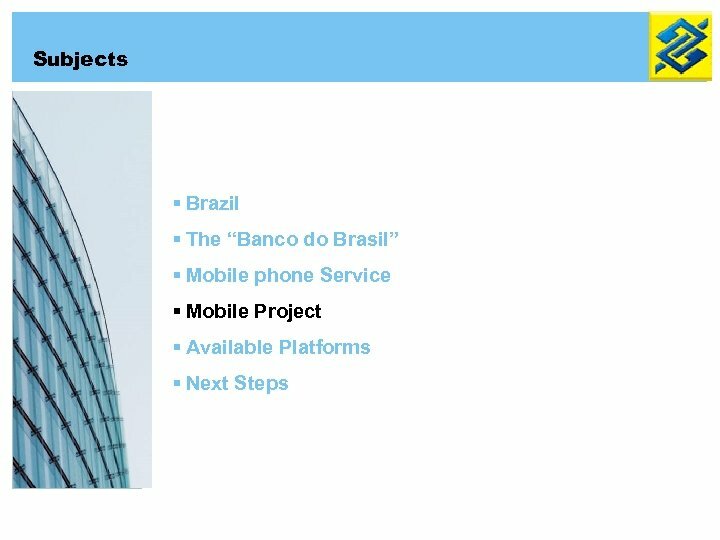 § We are present in 10 cities in Brazil. 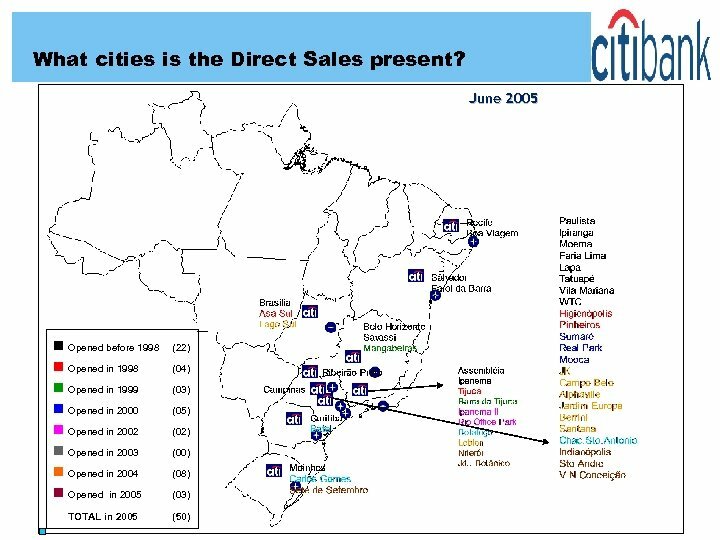 The Direct Sales Area… What’s the importance of Direct Sales for the retail Citibank Brazil ? ? 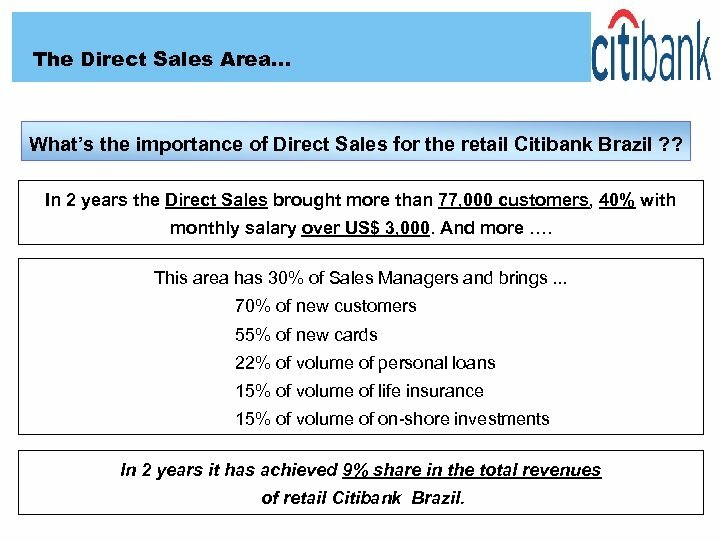 In 2 years the Direct Sales brought more than 77, 000 customers, 40% with monthly salary over US$ 3, 000. And more …. This area has 30% of Sales Managers and brings. 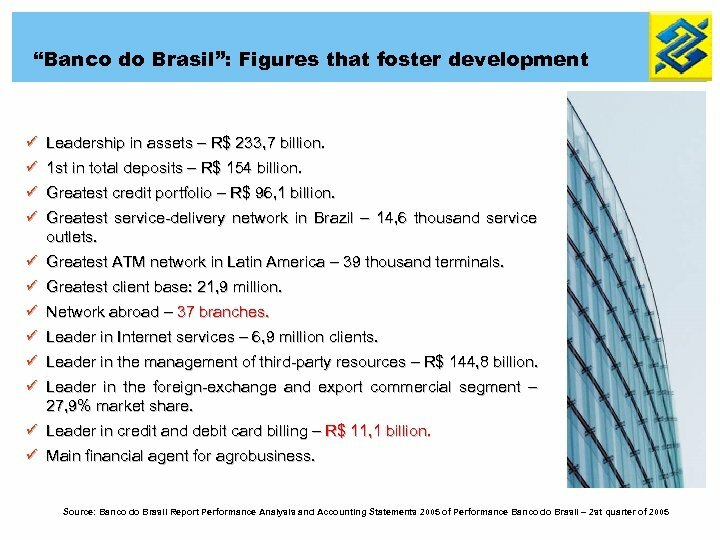 . . 70% of new customers 55% of new cards 22% of volume of personal loans 15% of volume of life insurance 15% of volume of on-shore investments In 2 years it has achieved 9% share in the total revenues of retail Citibank Brazil. 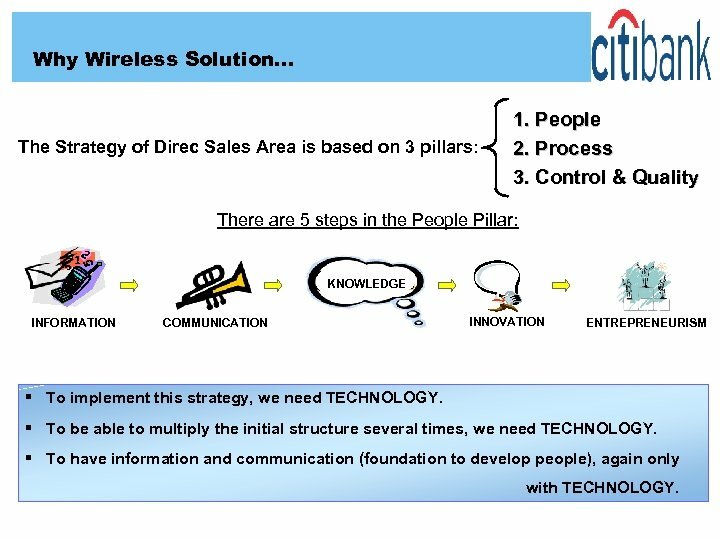 Why Wireless Solution… The Strategy of Direc Sales Area is based on 3 pillars: 1. People 2. Process 3. 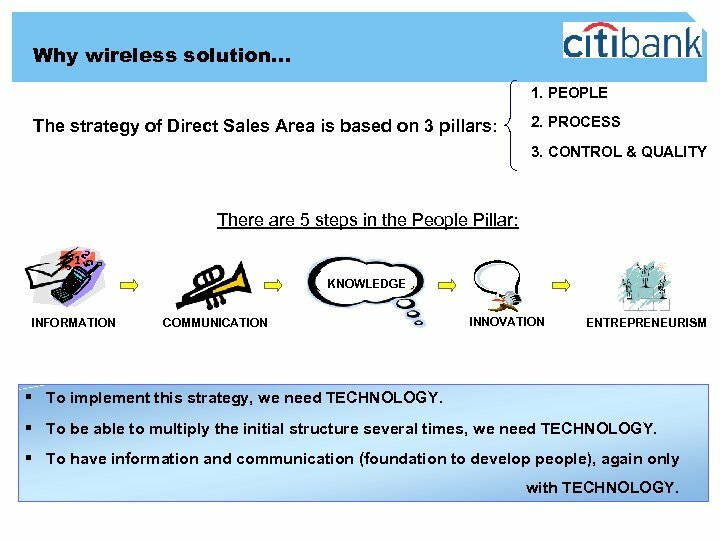 Control & Quality There are 5 steps in the People Pillar: KNOWLEDGE INFORMATION COMMUNICATION INNOVATION ENTREPRENEURISM § To implement this strategy, we need TECHNOLOGY. § To be able to multiply the initial structure several times, we need TECHNOLOGY. § To have information and communication (foundation to develop people), again only with TECHNOLOGY. 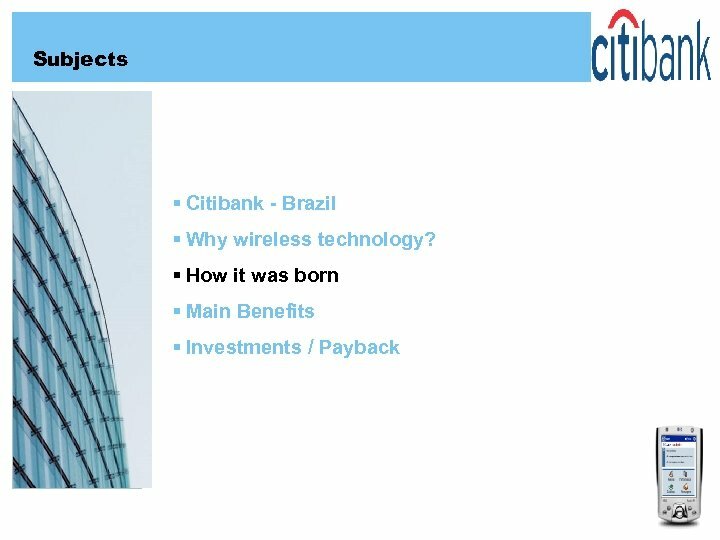 Why wireless solution… 1. 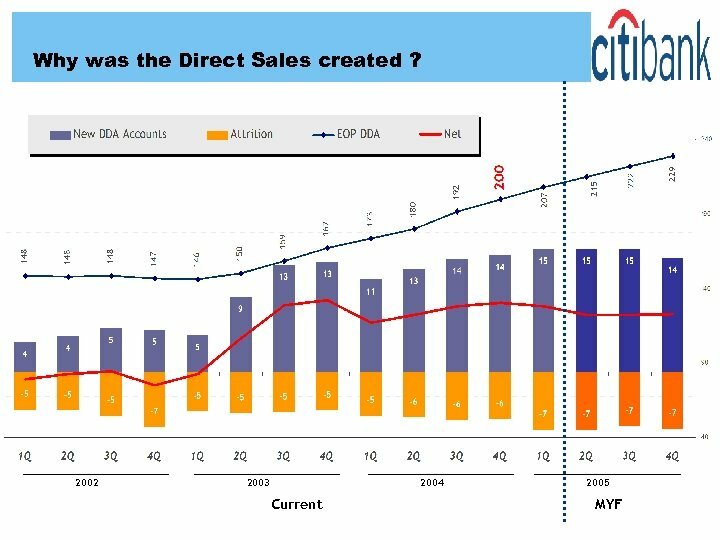 PEOPLE The strategy of Direct Sales Area is based on 3 pillars: 2. PROCESS 3. CONTROL & QUALITY There are 5 steps in the People Pillar: KNOWLEDGE INFORMATION COMMUNICATION INNOVATION ENTREPRENEURISM § To implement this strategy, we need TECHNOLOGY. § To be able to multiply the initial structure several times, we need TECHNOLOGY. § To have information and communication (foundation to develop people), again only with TECHNOLOGY. 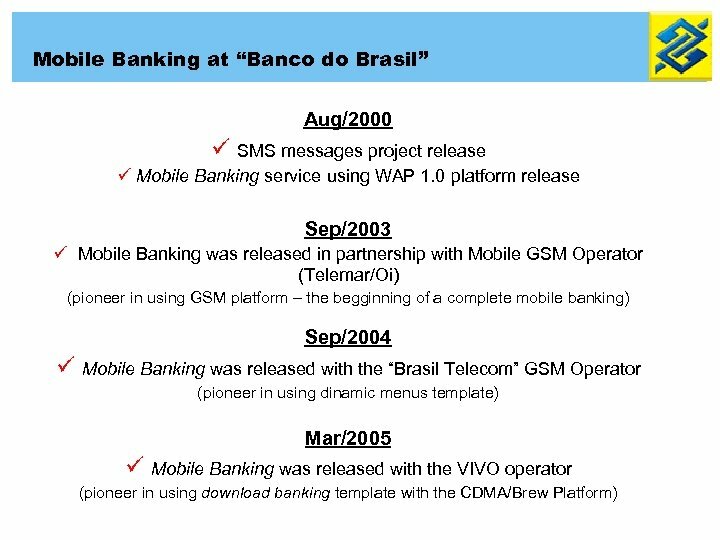 How it was born… The second most important step. . . Find people in the Company with an open-mind and empowerment. 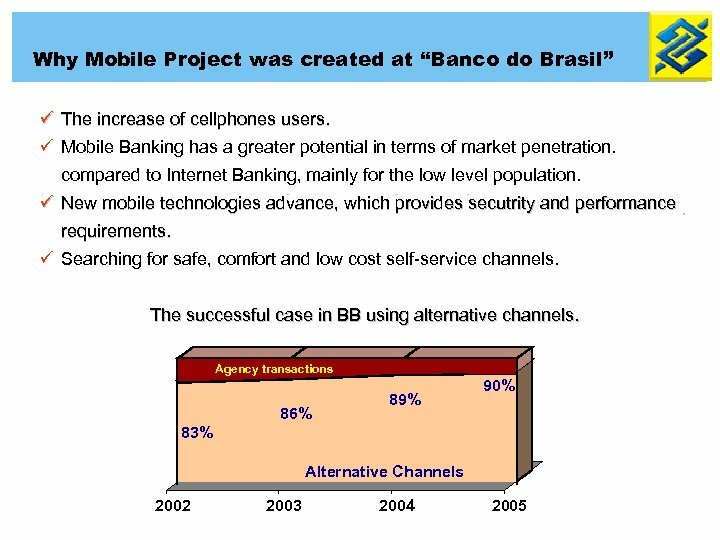 Oct/2003: Meetings with People with empowerment in Technology, Compliance, Legal and Infosec to decide the development of this wireless solution and break paradigms. 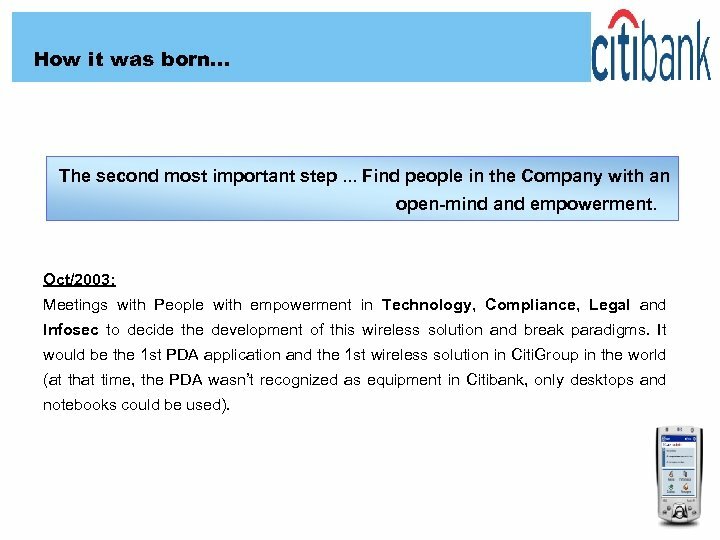 It would be the 1 st PDA application and the 1 st wireless solution in Citi. 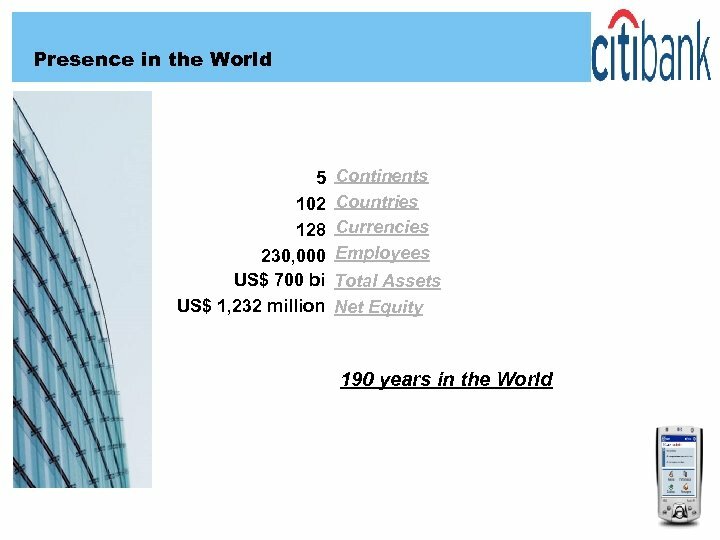 Group in the world (at that time, the PDA wasn’t recognized as equipment in Citibank, only desktops and notebooks could be used). How it was born… The third most important step. 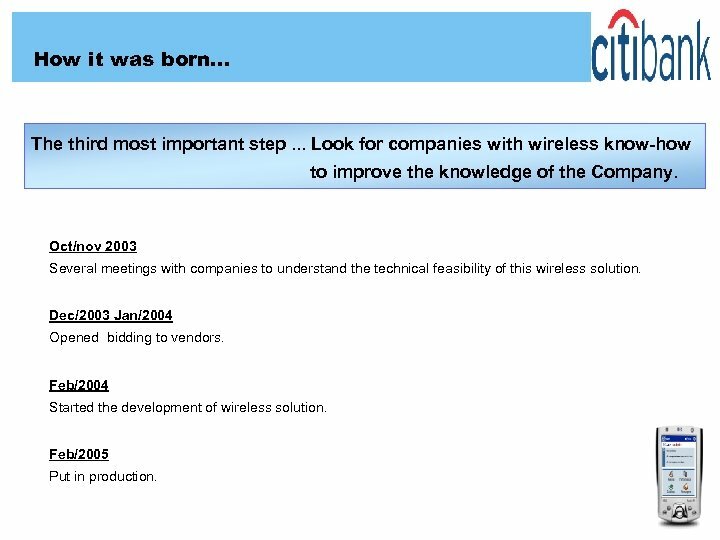 . . Look for companies with wireless know-how to improve the knowledge of the Company. Oct/nov 2003 Several meetings with companies to understand the technical feasibility of this wireless solution. Dec/2003 Jan/2004 Opened bidding to vendors. 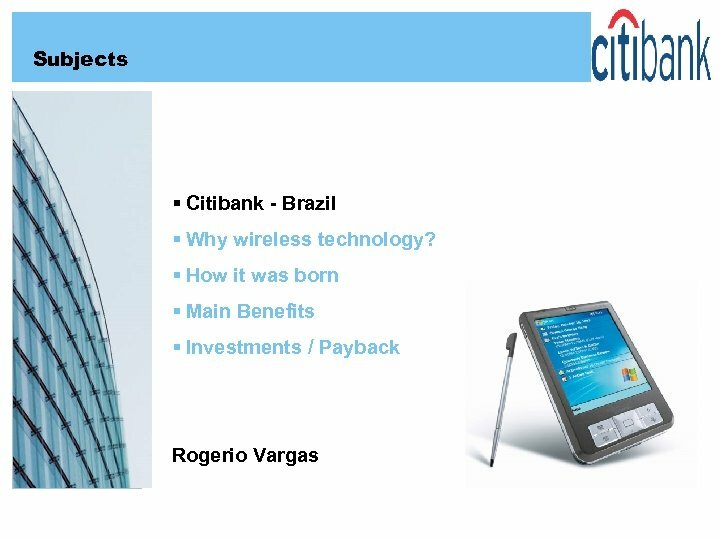 Feb/2004 Started the development of wireless solution. Feb/2005 Put in production. Benefits Employee Clean Process. 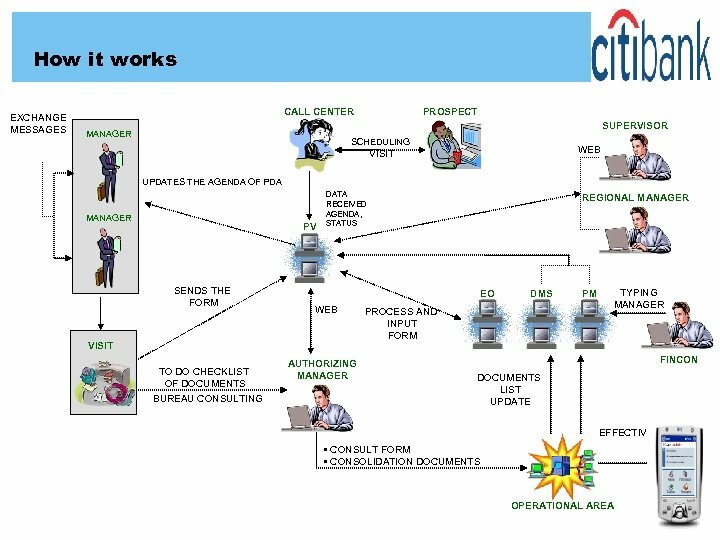 Paperless in mid-term with digital certification. Less bureaucracy. Without copies of documents in mid-term. 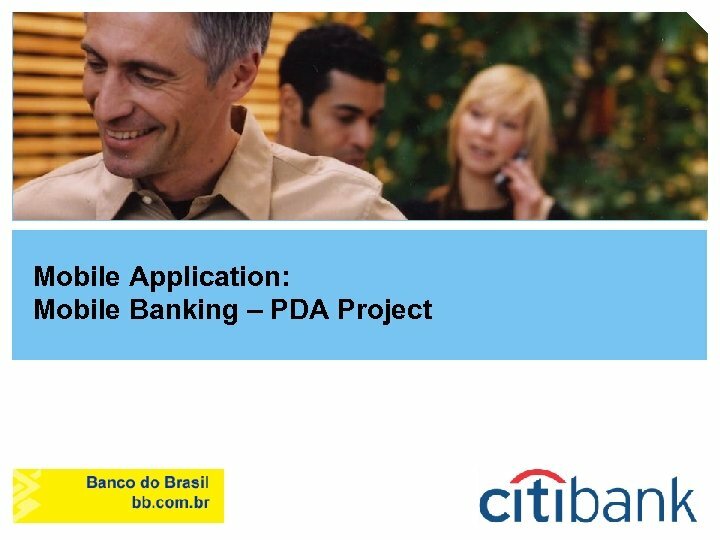 Reduce time of opening banking account. 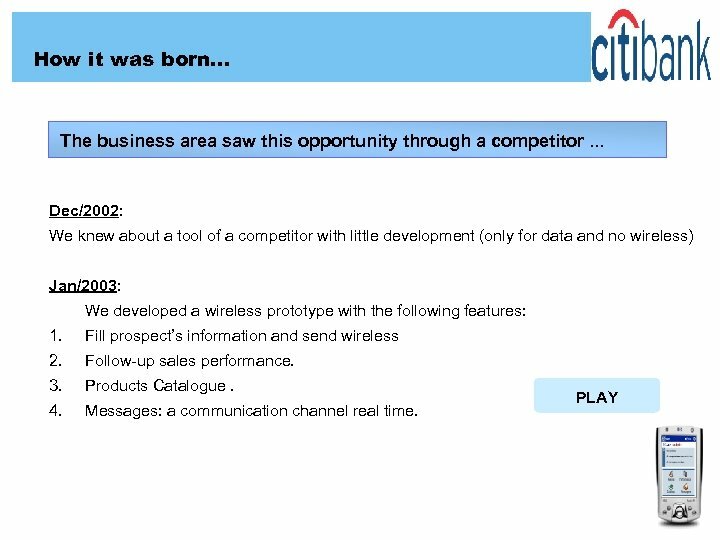 § Customer § § § Development of People: Implement a quick and effective communication channel. 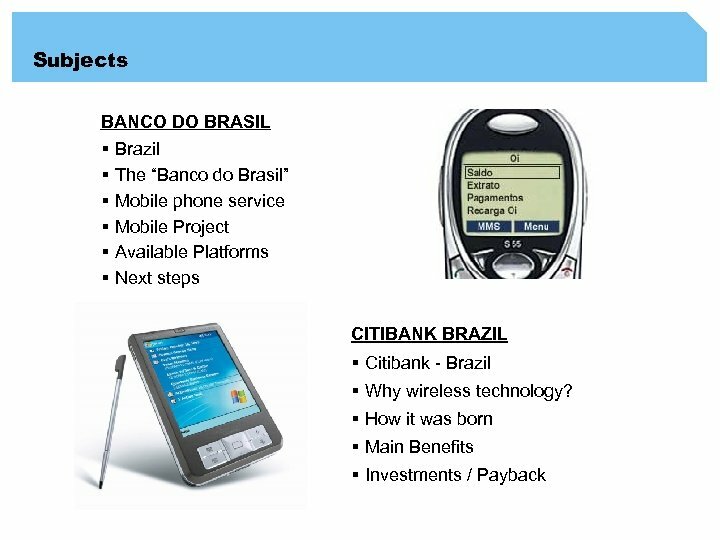 Development of People: Handling a high technology tool. Motivation: Provide in real time data and information to improve sales. e. g. : Opportunities focusing on bulk acquisition such as niches and payroll Companies. 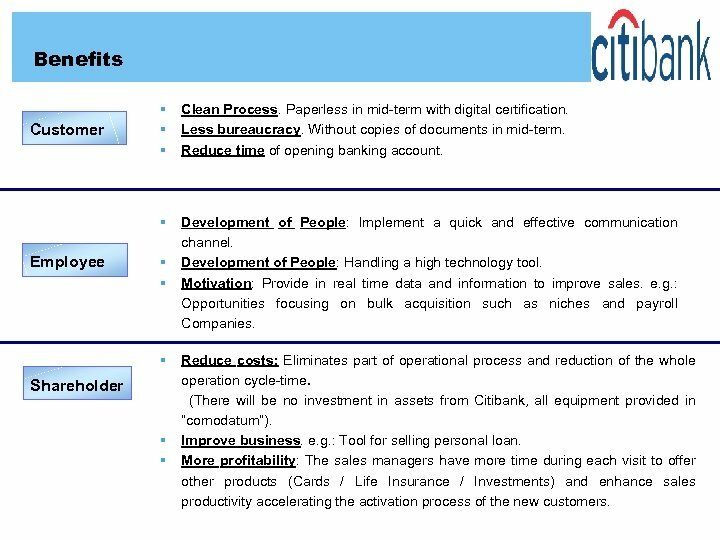 § § § Shareholder § § Reduce costs: Eliminates part of operational process and reduction of the whole operation cycle-time. 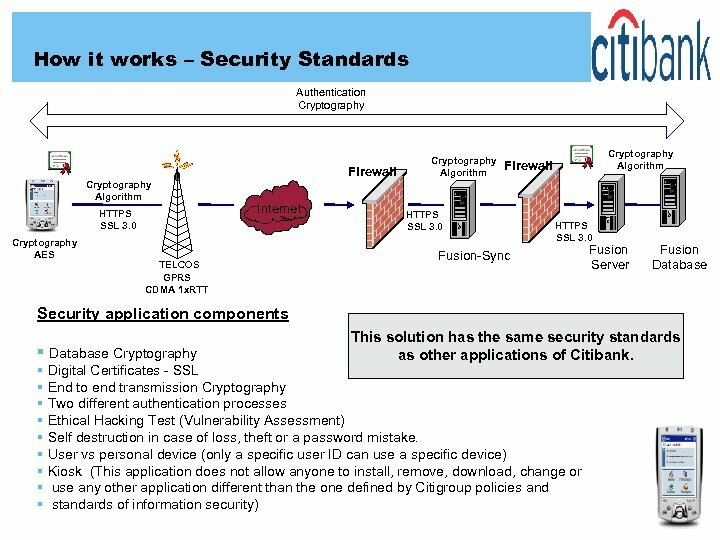 (There will be no investment in assets from Citibank, all equipment provided in “comodatum”). Improve business. 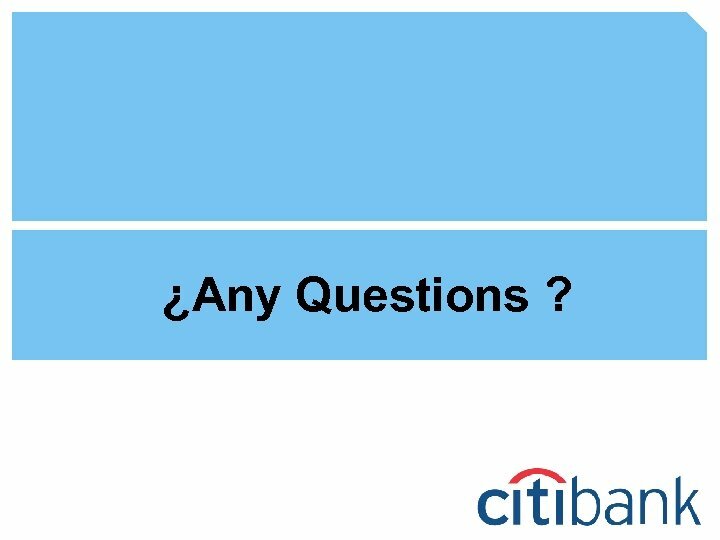 e. g. : Tool for selling personal loan. 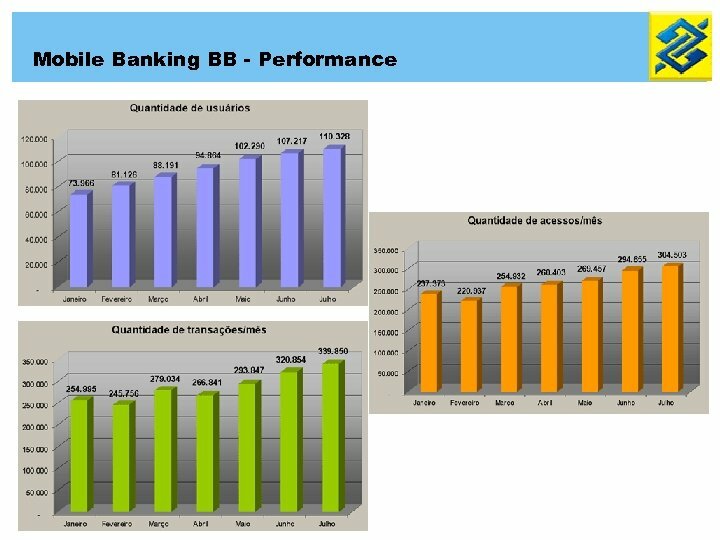 More profitability: The sales managers have more time during each visit to offer other products (Cards / Life Insurance / Investments) and enhance sales productivity accelerating the activation process of the new customers.